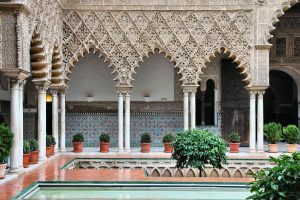 Explore the real life Water Gardens of Dorne! There are a few burning questions we all hope are answered soon in the new season of Game of Thrones. What course will the Mother of Dragons pursue with her new league of extraordinary allies? What’s going to happen to Septa Unella? When will the White Walkers finally return — and where exactly did Gendry go? Tensions will surely be high until the show’s release date on July 16. Rather than spending the few months scrolling through fan fiction, take a trip and explore the real Game of Thrones! Visit two of GOT’s most famous filming locations: Spain and Iceland. When Samwell Tarley returned to Horn Hill in season 6, viewers were introduced to another gorgeous GOT filming location. His ancestral home is actually the Castell de Santa Florentina in the town of Canet de Mar in the Spanish region of Catalonia. Dating back to the 11th century, the castle is open to the general public. The tour takes you through the massive grounds and traditionally ends with a conversation and a glass of Spanish sparkling wine. The Alcazar of Seville is a Moorish castle built in the 1300’s and serves as the filming spot of the Water Gardens of Dorne where Prince Doran spends his time in season 5. Take a tour through the castle’s rich landscape. Explore the spectacularly decorated halls and spend time in the lush, vibrant grounds. This Icelandic tour traces the footsteps of your favorite characters through the mysterious hills and paths seen on the show. You can visit the stomping grounds of the White Walkers, explore the Wilding’s trail from North of the Wall, and witness the exact spot where many characters “lost their heads”. This entry was posted on Wednesday, March 29th, 2017	at 11:29 am	. You can follow any responses to this entry through the RSS 2.0	feed. Responses are currently closed, but you can trackback from your own site.